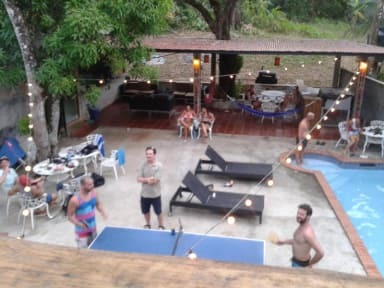 Hostel Villa Vento Surf i Santa Catalina, Panama: Reservér nu! We have a swimming pool in our garden, a great lounge where you can watch TV (new 50 plasma), listen to music, drink a beer (we sell beers in $1), and just relax! Also we organize fun activities during the week. We offer the perfect balance between a fun and a relaxed atmosphere. The rooms are separated from the social areas for those who want an early night. We want you to feel like a traveler here, and not a tourist. You can come at any time (24 hours reception) and if the rooms are not ready yet, you can relax in the social areas. Last but not least, we arrange trips to San Blas and sailing trips to Cartagena. Santa Catalina is a small town. We are located in the main street of Santa Catalina in front of the bakery La Vieja the bus stop is a 2 min walk from our hostel. The surfing beach is a 15 min walk from the hostel. We have private and shared rooms that comes with shared bathroom facilities. Comfortable beds with included linen. Fully equipped common kitchen available for our guests.And for our hungry guests in the morning, we have the breakfast included! Pancakes and Coffee from 7am until 10am. Hostel Villa Vento Surf Policies and Conditions.